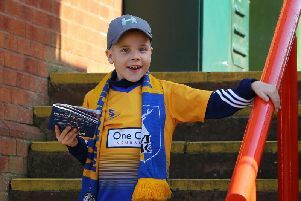 Mansfield Town were unable to end the season on a win as they were held 0-0 by Cambridge United at One Call Stadium this afternoon. That left Adam Murray’s men finishing in 12th position after a typical end of season game in warm sunshine. There were few chances at either end, though Matt Green did have an effort ruled out for offside just before the break. Ryan Tafazolli, out of contract this summer, was injured in the first half and replaced at the break, with Stags fans wondering if that was the last they will see of him. There was a debut as sub for youth team player Zayn Hakeem, and he and the inspirational Lee Collins brought fresh impetus with their energy to a much better second half for the Stags. But no one could find a finishing touch in a game that contained only one real on-target effort with both keepers more likely to get a suntan than make a real save. Stags could at least take heart from a clean sheet against one of the better sides in the division. Boss Adam Murray made just one change as Chris Clements, fully recovered from his hamstring injury, took over from Reggie Lambe. Two youth teamers were on the bench in midfielder/striker Hakeem and striker Jason Law. With both sides out of the play-off running, only pride was at stake with Stags aiming to beat their 11th place finish of two seasons ago. The afternoon began with centre half Tafazolli picking up a host of awards including Chad Readers’ Stags Player of the Year. There were also cheers as chairman John Radford unveiled the old North Stand clock on the top of the Bishop Street gantry, donated back to the club by director Steve Hymas in memory of his late daughter. Stags were immediately put on the back foot from kick-off, having to defend three early corners. Mansfield finally got out their half after five minutes and won a free kick on the right which Benning curled low towards the near post. However, Norris was down to gather and the ball appeared to be going just wide anywy. Cambridge went close seconds later as skipper Berry rifled a low shot narrowly wide from 20 yards. United took their corner count to five after 14 minutes and a minute later Berry lifted an inviting ball over the defenders to the right of goal from where Ledson smashed a volley inches over. Tafazolli was then shouting at his team mates after having to throw himself full length to block a powerful Dunne shot. It took Stags 20 minutes to win a corner, Collins heading wide from Chapman’s delivery. Ledson used his hands to block a Clements free kick just outside the box on 23 minutes to see the game’s first yellow card, but Clements’ free kick was deflected wide. After a real lull in the action, Stags came close on 35 minutes when Tafazolli headed a Chapman free kick back into the middle and Pearce hooked the ball wide of the far post, where it just needed a touch from a yellow shirt to finish. Stags finally found the net a minute before the break, only to be denied by an offside flag. Tafazolli headed on a Chapman free kick and Green popped up to bury a close range volley, but had strayed offside. A long ball to the far post in stoppage time caused a late scare for Stags, but they survived and the sides went in 0-0. Tafazolli had needed lengthy treatment in the first half and did not re-emerge, Baxendale taking over in midfield, Rose moving to the right back and Collins into the centre of defence. Stags won an early corner but, after a scramble, Collins shot tamely wide. Green also shot tamely from 20 yards straight at the keeper, the game’s first on-target shot on 52 minutes. Then Shearer had to beat Berry to a through ball at the other end. On 56 minutes youth team player Hakeem was sent on for his debut for Dieseruvwe to huge applause, and he quickly got in on the action, beating a defender in the box but unable to square it to a team mate. Stags had been much improved since the break and on 61 minutes Clements saw his low shot cleared just in front of goal. The game exploded into a shoving contest on 74 minutes after Dunne had hacked down Baxendale in full flight, the referee eventually showing him a yellow card. Yussuf was given the last seven minutes in place of Green, but Cambridge held out for the point. STAGS: Shearer, Benning, Tafazolli (Baxendale HT), Pearce, Collins, Rose, Chapman, Clements, Blair, Dieseruvwe (Hakeem 56), Green (Yussuf 83). Subs not used: Jensen, Lambe, McGuire, Law. CAMBRIDGE: Norris, Legge, Berry (Clark 63), Dunk, Coulson (Roberts HT), Dunne, Ismail, Spencer, Williamson (Donaldson 86), Ledson, Furlong. Subs not used: Beasant, Omozusi, O’Neill, Williams. REFEREE: Eddie Ilderton of Tyne & Wear. CHAD STAGS MAN OF THE MATCH: Lee Collins.